Go Native, A Unobtrusive petite hideaway with a Farm to Table Vegetarian restaurant and lifestyle store located in residential part of Jayanagar. A couple of months old place has good potential patron base within short span of time. I was here for lunch along with few foodies upon Invitation. The place has a great ambiance by focusing more on Nature. So, the place is surrounded by the tropical greenery within the compound. The two storey building property has minimalist interiors with al-fresco seating. Precisely, every table has a story to tell. As you enter inside, can witness some of the exclusive brands like Classic Coffees, The Purple Turtles, Bandhej, Illuvia, Varnam, Nature Valley, Proyog, Last forest, Tea Box and many more in the lifestyle store! These are some of the brands associated closely with Nature. Our lunch started with a Welcome drink Watermelon Cooler, which was refreshing and certainly needed to get rid of thirstiness. A long table in the first floor was set for the exclusive tasting preview of new menu, which introduced for the season. 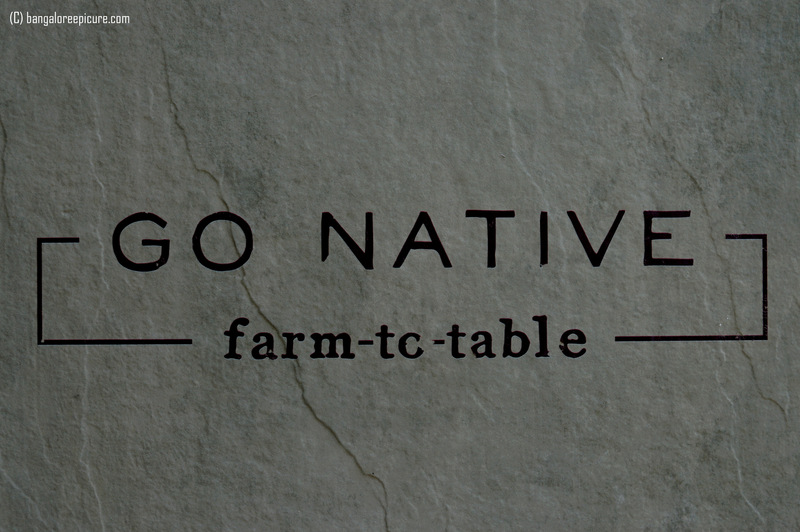 Well, Go Native keeps changing the menu according to the season and availability of ingredients. Also, the cuisine at Go Native is a combination of Fusion South & North Indian for Breakfast, Lunch and Dinner. A bunch of us decided to order some of the signature dishes from Menu which includes Mango & Tomato Gazpacho, Summer Salad, Kesari Piyar Salad under Soups and Salads, which were pretty good and quite appealing though. We end up ordering again, especially Summer Salad. Next set of dishes we ordered were Cheese Sakarkandi Roll, Mangalore Buns, Mango Chat, Aloo Patha Bindi Chaat, Paddu, Bisi Bele Millet Fritters and Yam Gallouti. Out of all these, I would certainly recommend Mangalore Buns – The buns were hot, golden brown, fluffy and soft with a hint of banana flavor and tasted out of world with fresh coconut chutney. I will certainly order buns when I visit next time. Mango Chaat was nicely done with balance sweet and spice levels and decent portion size. Aloo Patha Bindi Chaat was the showstopper in the small plates aka starter category. It was just fabulous again with sweet and spice levels and fried Bindi garnishing made the dish even good. Paddu was nicely made with golden brown and white texture and served with Tomato based chutney and Tamilnadu style drumstick & dal Sambar. However, I felt it’s higher on the cost wise. Yam Gallouti would be the nice choice for vegetarians who can’t eat Mutton Gallouti Kebabs. I had the Jackfruit Gallouti in Past and this was as good as that. The Kathal aka Raw Jackfruit Biryani served with Raitha and Papad was pretty decent with low spice level and good flavors though. Folks who think and endorse about other Biryani’s can avoid it. Since it’s nowhere close to what we had at other places. I recommend this dish for people who would love to explore homemade style unique types of Biryani. The Thali Comprises Puliyogare, Mango Salad, Mango Shikarni, Poori’s, Mix Veg Curry, Papad, Baigan Bartha, Payasa and Curd. The wholesome Thali is more of a North & South Indian types and I can vouch the quality and taste of Thali. On a sweet note, lunch finished with Millets Pancakes, Panacotta of Ice Apple, Carrot Halwa Tart and Mango Cake with Homemade Vanilla Cream Cheese. Millet Pancakes were crunchy with right sweet level and extremely good. Whereas, Ice Apple Panacotta was another showstopper for the afternoon! One must definitely try! The whole dining experience was good amidst of Nature loving property and people. They had few hiccups during the initial days and seems like its sorted based on my experience. The service was quick and waiters are patient and sweet enough to take & deliver orders. Overall, it was a great experience and would personally like to Thank Harsha aka Bakasura, Go Native Team and Skreem for having us to this beautiful place. Note: This write-up is completely based on my experience and not influenced by anyone though it’s an Invite from Venture.